Ok, so I can’t show you all the fruits of yesterday’s labors (day #6 of my Daily Life posts) because they are a surprise for some of my family and friends. But I’m willing to show you a couple of them. I got this idea out of the blue the other day and am pleased with how well they turned out. The short of it is that I printed pictures onto cardstock paper, cut them into appropriate sized strips, and covered with clear packing tape. But a lot more went into it than that. 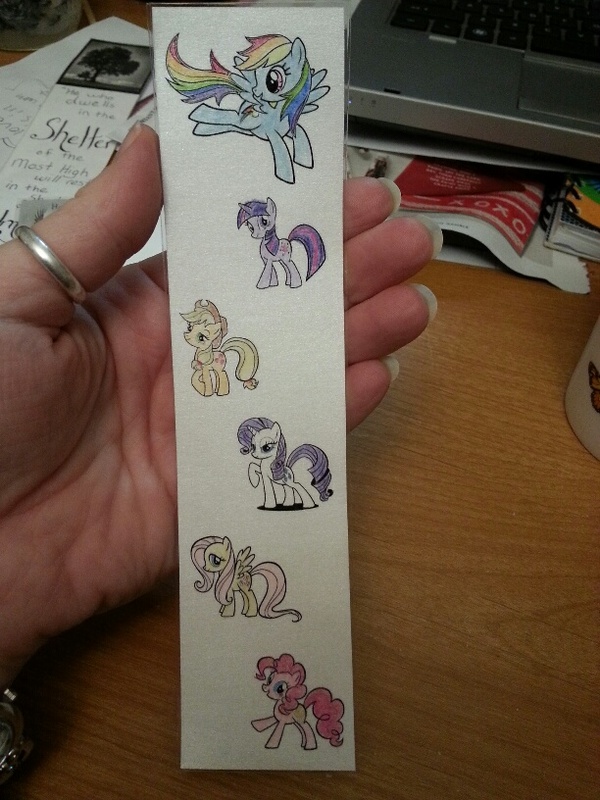 First I did some test bookmarks a couple weeks ago to work out the bugs. I learned that using cardstock it essential. Even with the tape, regular paper is too flimsy. 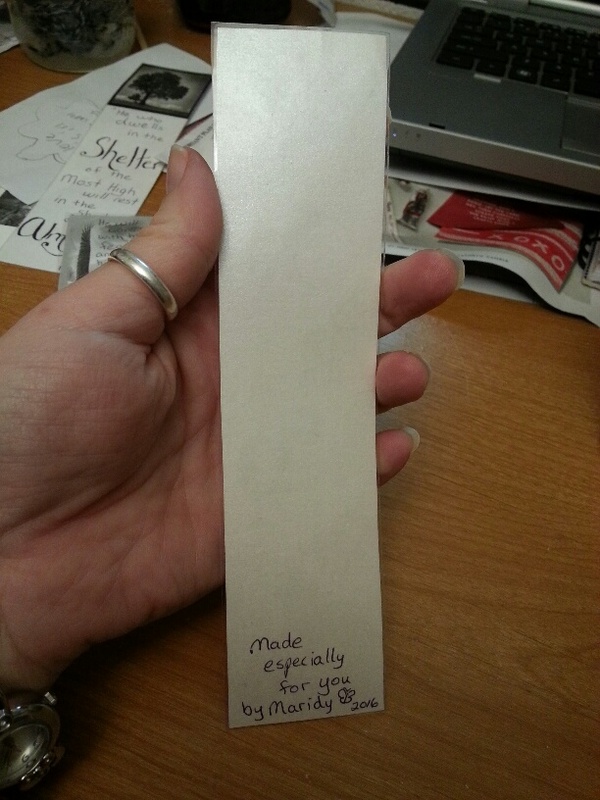 I also learned the best way to get the tape onto the paper without wrinkles. Static cling’s a pain! I made a simple template on my computer so that as I planned pictures, etc they would be the correct size. My clear packing tape is 2 inches wide, and I learned that you want some space on the sides, so I made my columns on my template about 1.6 inches wides. With my paper in “landscape” configuration, that gave me 6 bookmarks with a bit of space in between each one. Arrange your chosen pictures on the page and printed them. Now, our printer only prints in black and white, so I had to get creative. Some pictures look better in black and white than others. Carefully cut them out (oh, where’s one of those old fashioned paper cutters when you need one?). I used a ruler and a pencil to get straight lines. Now I channeled my inner child and started coloring. Remember, they were all in black and white. Some only had one picture to color, others I didn’t want colored, prefering to leave them as printed. On nearly all of them, however, I added some sort of hand written message. Could I have typed something up on the computer instead? Of course, but I wanted it to be more personal than that. And of course, if you are an artist, you can skip the printing stage and just draw, color, paint, sketch, design, etc something freehand onto appropriately sized pieces of paper. If you’re putting time and effort into making these, don’t forget to put a maker’s mark of some sort on it! I put mine on the back. Then comes the tricky part. Putting the tape on. 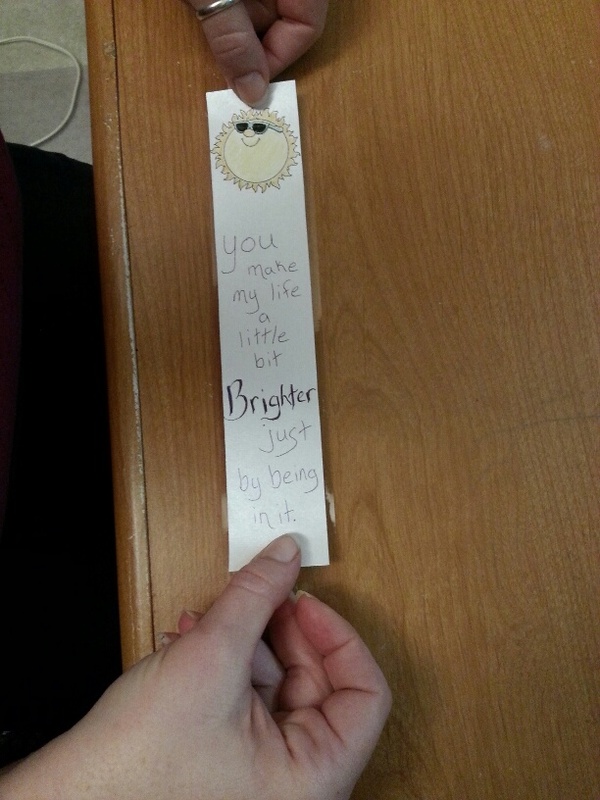 Once you have your bookmark decorated to your liking, tear off a piece of tape that is a couple inches longer than your bookmark. 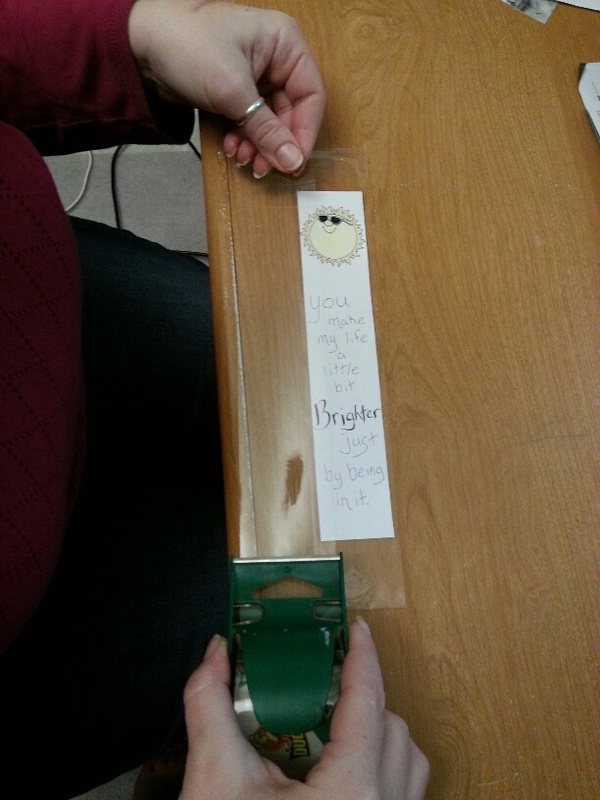 Then you are going to hold the tape sticky side up and tuck each end under about an inch and tape it to the table top. Hopefully the picture below will show what I mean. 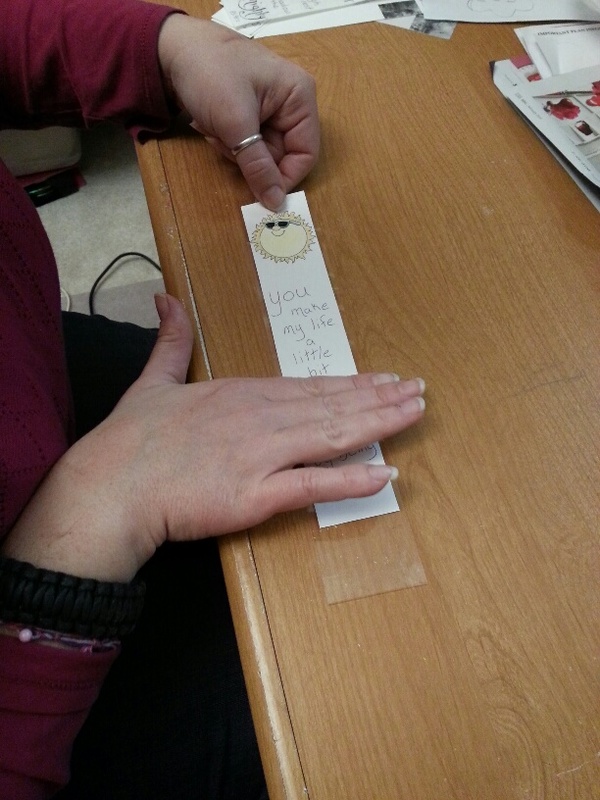 Then position your bookmark above the tape, centering it on the tape as best as possible. But don’t let it touch the tape yet! Once you have it centered, let one end touch down. 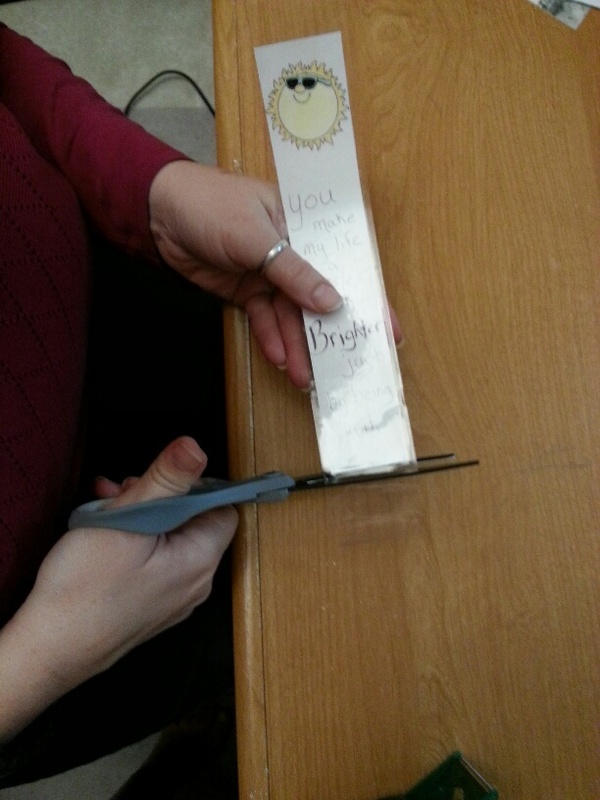 Then, holding the other end slightly above the tape, smooth along the length of your bookmark, starting with the first end you stick down and working toward the end you’re holding. 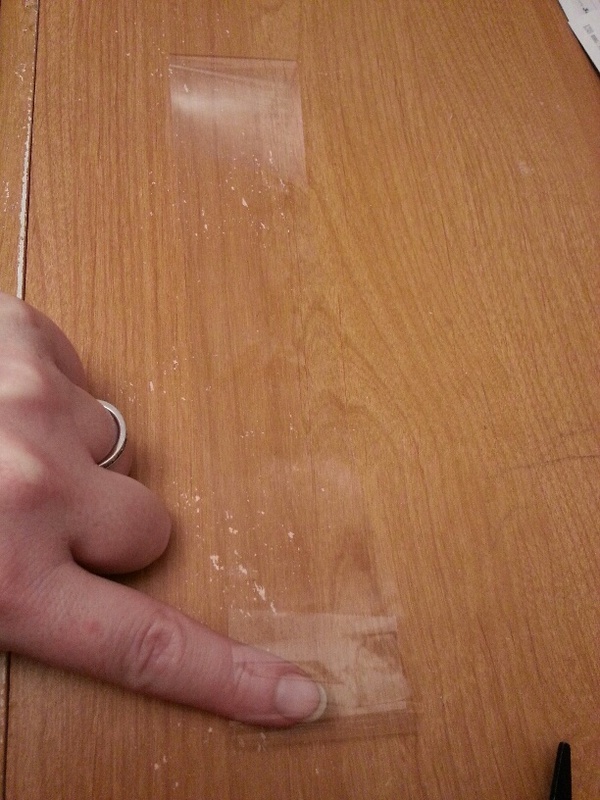 This will prevent the tape from bubbling or wrinkling underneath. Don’t ask how many bookmarks it took to come up with this technique! 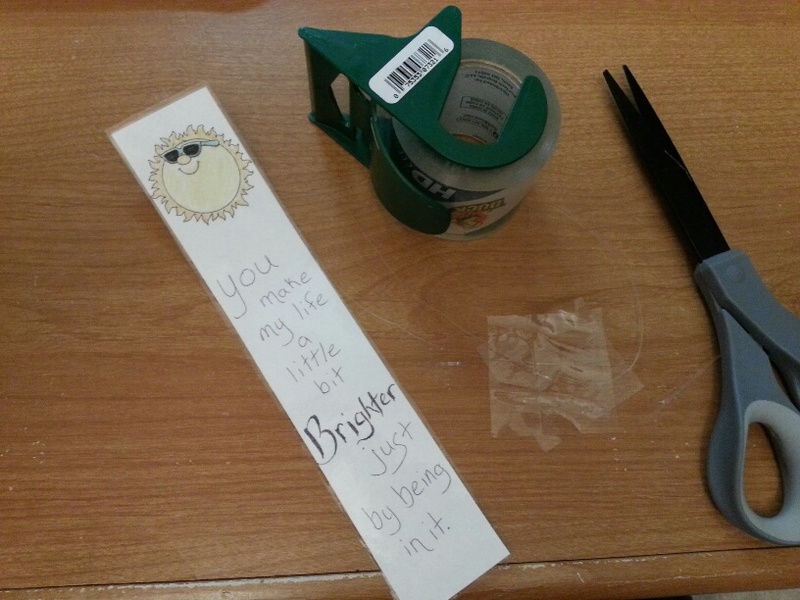 Wrinkled tape ruins all that work you just did! Smooth it all over and trim all around it with scissors. And there you have it. 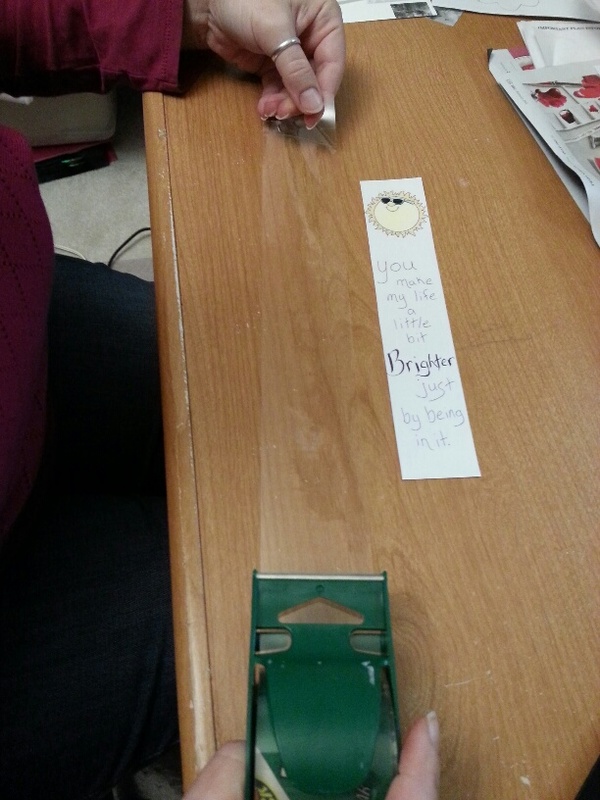 Fully customizable homemade bookmarks. Easy enough to make for all your book-loving friends. This entry was posted in "Daily Life" journaling, DIY, Portland Interlude 2014-2016, Skills and tagged Crafts, DIY on February 1, 2016 by Maridy.